The Cell is a perfect example of why I love to revisit older films that I saw once when they originally came out, but remember very little of. So it appears waiting 13 years to revisit this one has given me a whole new appreciation and such a different perspective of Tarsem Singh's The Cell. What I remember about this film in particular were the stunning surreal images. No real sequences stuck in my head during that initial viewing, but rather just a few standout shots, and really nothing else. Hell, I don't even remember Vince Vaughn being in this. 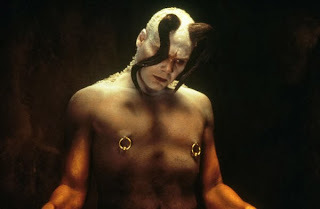 And if I were to pinpoint the only things I did recall about this it would be that it starred Jennifer Lopez, Vincent D'Onofrio, played out like a surreal nightmare with stunning visuals and was directed by the guy who had done that R.E.M. video "Losing my Religion", which was such a huge hit. The Cell blew me away for so many reasons. Not only is it a surrealistic and nightmarish masterpiece of visualist cinema, but it's also an expertly choreographed thriller. Probably one of the best thriller's I've seen done this way in a very long time. And that's what surprised me the most about this, because while those amazing surreal sequences are aplenty in here, a good chunk of the film is a straight forward detective thriller with an exhausted, yet dedicated detective, played by a great Vince Vaughn, on the hunt for a serial killer and his last remaining victim who's yet to be found, and quite possibly still alive. And I think that's actually the part I liked most about this film; the detective thriller aspect. I love these types of films. It's dark, and brooding and quite intense at times. Every now and again a filmmaker comes along and get's this formula right. Great examples would be David Fincher's Seven, or Kathryn Bigelow's Blue Steel. This one certainly falls under this category. I'll be the first to admit that I just don't like Jennifer Lopez as an actress. I really, really don't. She annoys the hell out of me. Maybe that was one of the factors that kept me away from this for so long? Possibly. But I gave this another shot anyway and well, you know she wasn't bad at all. This was about 5 years into her theatrical film career, so still sort of a newbie I suppose. But she was fine. Quite frankly, I was surprised she didn't ruin this for me. I think that was my biggest fear. My head doesn't automatically go to Jennifer Lopez when thinking of a dark surrealistic thriller. And it's funny, even today when I see her name in a new film, I just roll my eyes. But moving on. Vincent D'Onofrio again demonstrates why he's one of the more unique actors in his field. He can pull off a certain kind of character that not a lot of others are capable of, and he does it so effectively well. You also have to admire his dedication to any part. Much like De Niro has done in his career, D'Onofrio can physically transform his body for a role. Just take a look at his role in Stanley Kubrick's Full Metal Jacket, or his small but effective cameo in Adventures in Babysitting, or his turn as detective Goren in Law & Order: CI for 10 years. Hell, even his role in Men in Black was oddly perfect. And while this film is peppered with a lot of recognizable character actors, it's really Vince Vaughn that caught me off guard. He's been sort of pigeon-holed into making one lame subpar comedy after another, I often forget that he can turn in a serious performance from time to time. And he was just great in this. Tired, weary, dedicated and not very pleasant, he plays this detective character with such a degree of intensity that you wish he would do more work like this. I've got to hand it to director Tarsem. He goes by Tarsem Singh now, but I remember when this first came out, and when he was doing music video's, it was always just Tarsem. He just always stuck with me as a brilliant visual director, whether it be music videos or commercials. And I remember when that R.E.M. video came out it was huge, winning lots of praise and lots of awards, deservedly so. And with his first film in The Cell, he goes a step further with a bigger budget and it's simply breathtaking what he can pull off. I still find myself trying to figure out some of the things pulled off in this film. And what I loved was that it could go from purely fantasy and bright and beautiful, to dark and gothic and surreal. And while the detective thriller storyline is a big central part of the film, and what ultimately pushes the story along, it's the dream sequences that will stay with you. They are magnificently orchestrated, and flawlessly executed and that's all due to Tarsem's mastery of the visual form. Just look at his second film The Fall for further proof. I think I'll end this on a final note and mention that I won't bother with a synopsis. First of all, it's not my style, and secondly, it's best to go into this without anything being ruined for you. For me that just always makes for a much better film experience. What I will say is that this was a gorgeously shot detective thriller with some mind numbing and stunning surreal dream sequences intermixed with a top notch hard-edged detective storyline; all put together effectively well with stunning eye candy by visionary director Tarsem Singh. I think it's really interesting to revisit some of these movies from past years, as you've done so well here on your blog. Firstly because films reveal new things and are experienced differently at different ages of our lives, and secondly knowing more about the actors -- and in this case, the director -- adds to subsequent viewings. Even Immortals was a fantastic visual experience. The Cell is my all time fav movie EVER. Yet, everyone I talk to has never seen it ! AH! There's also barely anything on it via the web besides the same stills and dvd. 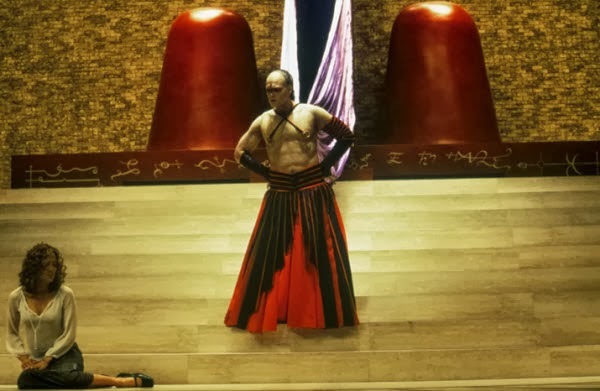 Tarsem is my all time fav director, not just because he did this movie, but because I seen "The Fall" (which apparently only had 1 piece of cgi in it: the guy coming out of the tree in the desert. everything else- inc the locations- are all real). Everything he does is very artistic, and I love him. I own every movie of his on bluray. You're absolutely right. Most people don't know anything about this, or that it was also made by the same guy who did The Fall. Most people know that one more than this and it's a shame because this one is pretty freakin' amazing. I still can't understand why I didn't remember it very well until I saw it recently. But that worked in my favor because it was like watching it for the first time all over again. Tarsem is a force to be reckoned with. Even his "cute" film, Mirror, Mirror, was enjoyable, thought it didn't look or feel like a Tarsem film. lol. And I have to admit, I still haven't seen Immortals yet. lol. I've been told by almost everyone that it isn't any good, so I've held off. Should I watch it?? ?